Video abstract presented by Lauren Ball. Abstract: Landmark reports have confirmed that it is within the core responsibilities of doctors to address nutrition in patient care. There are ongoing concerns that doctors receive insufficient nutrition education during medical training. This paper provides an overview of a medical nutrition education initiative at the University of Cambridge, School of Clinical Medicine, including 1) the approach to medical nutrition education, 2) evaluation of the medical nutrition education initiative, and 3) areas identified for future improvement. The initiative utilizes a vertical, spiral approach during the clinically focused years of the Cambridge undergraduate and graduate medical degrees. It is facilitated by the Nutrition Education Review Group, a group associated with the UK Need for Nutrition Education/Innovation Programme, and informed by the experiences of their previous nutrition education interventions. Three factors were identified as contributing to the success of the nutrition education initiative including the leadership and advocacy skills of the nutrition academic team, the variety of teaching modes, and the multidisciplinary approach to teaching. Opportunities for continuing improvement to the medical nutrition education initiative included a review of evaluation tools, inclusion of nutrition in assessment items, and further alignment of the Cambridge curriculum with the recommended UK medical nutrition education curriculum. This paper is intended to inform other institutions in ongoing efforts in medical nutrition education. The importance of nutrition in maintaining good health is widely recognized.1–3 Landmark reports have confirmed that it is within the core responsibilities of doctors to address nutrition in patient care.4,5 Doctors commonly report insufficient knowledge and skills related to nutrition,6,7 and there are ongoing concerns that doctors receive insufficient nutrition education during medical training.8–11 Key mandates exist within countries such as the United Kingdom and United States to enhance the nutrition education received by medical students.4,5,12–14 However, the integration of nutrition into medical education is a continuing challenge worldwide. For the purpose of this paper, “medical education” refers only to the study of medicine by medical students, not other health care professionals. The pervasive nature of nutrition creates a challenge to identify the most appropriate location for nutrition within medical curricula. Equally, this pervasiveness creates an opportunity to encourage interdisciplinary specialty teaching within medical education. Previous initiatives to enhance nutrition in medical education have focused on approaches to integrate nutrition into curricula17,18 as well as modes of delivery of nutrition education to students including, for example, web-based resources created to enhance student learning.17,19,20 These initiatives provide valuable information and examples to other medical institutions and facilitate ongoing development in this area of medical education. In line with this, our paper is intended to be utilized by other institutions to inform ongoing efforts in medical nutrition education. The Need for Nutrition Education/Innovation Programme (NNEdPro) is an independent education and evaluation program that aims to equip “tomorrow’s doctors” with clinically relevant, foundation nutrition and public health knowledge to enhance nutrition care in health care settings.21 In England, the University of Cambridge, Nutrition Education Review Group (NERG) is linked with NNEdPro and is comprised of doctors, dietitians, and nutritionists who are academic and research staff. The aim of the NERG is to develop, implement, and evaluate the medical nutrition education, particularly clinical and public health nutrition, provided to undergraduate and postgraduate medical students at the university. In early 2011, the University of Cambridge, School of Clinical Medicine, Department of Public Health and Primary Care, in collaboration with the NERG, piloted a nutrition education session in the first clinical year of the undergraduate medical degree. This teaching was shaped by the early work of the NNEdPro group22,23 and was incorporated into undergraduate and graduate medical curricula following favorable evaluations. The medical nutrition education initiative at the University of Cambridge, School of Clinical Medicine receives ongoing review and evaluation for delivery, content, and outcomes of teaching and students’ nutrition knowledge, attitudes, and practices. In this paper, we provide an overview of the progress of this initiative, specifically the evolution of teaching methods; the outcome evaluation; and areas identified for future improvements. The University of Cambridge, School of Clinical Medicine offers a 6-year undergraduate medical degree and a 4-year graduate medical degree.24 The overall aim of the medical nutrition education initiative is to increase nutrition awareness and skills of undergraduate and graduate medical students through a vertical, spiral approach which builds upon previous learning experiences. We provide an overview of the medical nutrition education within Cambridge medical training in Table 1. Notes: aGraduate students do not complete the 3-year Medical and Veterinary Science Tripos; bundergraduate and graduate courses align from middle of clinical year. Abbreviations: Y, year; N/A, not applicable. Students’ initial exposure to medical nutrition education occurs during the first clinical year of each degree. One component of the curriculum, “Clinical and Public Health Nutrition”, covers nutrition issues and their relevance to clinical practice by addressing some of the nutrition curriculum recommendations of the Academy Nutrition Group of the Academy of Medical Royal Colleges.27 The overall aim of this curriculum component is to equip students with information and resources to appropriately identify and address nutrition-related issues in the hospital setting. For undergraduate students, the cohort is divided into two groups, each undertaking a 4-hour session. The session begins with a plenary, following which students are split into three smaller groups. Each group rotates between three “carousel-style” workshops that focus on a particular area of nutrition, with topics including under-nutrition, obesity in the hospital setting, nutrition screening and assessment, fluids and electrolytes, and others, based on tutor availability. Each workshop is facilitated by a multidisciplinary team of doctors, dietitians, nutritionists, and nurses to present nutrition-related clinical scenarios that students may encounter in training and practice and demonstrate how each health profession may contribute to providing nutrition care to patients. The sessions aim to be as interactive as possible including opportunities to taste supplements, practice patient communication, and conduct anthropometric measures on fellow students. Graduate students experience a similar session in their first clinical year. The smaller student cohort allows for efficiencies of time, with similar learning outcomes achieved in a 1-hour session also facilitated by a multidisciplinary team typically including a doctor, dietitian, and public health nutritionist. Evaluation is an important and evolving feature of the medical nutrition education initiative at the University of Cambridge, School of Clinical Medicine. To facilitate evaluation at the initial stages, a feasibility pilot of a nutrition education session was conducted prior to its inclusion in the curriculum. Outcome measures were based on principles of formative evaluation. Since this time, the evaluation has focused on the nutrition education sessions within the first clinical year to ensure ongoing quality improvement with each successive session. The evaluation of these sessions has three aspects: 1) quantitative measurement of changes in students’ nutrition knowledge, attitudes, and practices through a pre- and post teaching multiple-choice questionnaire; 2) qualitative feedback from students on the delivery of the workshop; and 3) peer-facilitated feedback for workshop facilitators by the NERG members. Prior to the commencement of nutrition education teaching in the first clinical year, students are encouraged to complete an online multiple-choice questionnaire to measure nutrition knowledge, attitudes, and practices. The questionnaire has been construct-validated against key clinical learning outcomes from previous NNEdPro nutrition education interventions.22 One month after the nutrition education session, students are invited to complete the questionnaire again, and changes in the mean responses are calculated. Overall, the changes observed in nutrition knowledge, attitudes, and practices 1 month after the nutrition education sessions are promising. For example, the proportion of responding students who strongly agreed with the item “From a public health perspective, do you think that nutrition is important in reducing the global burden of disease?” increased from 0% to 70% after the delivery of a recent session. In addition, there is often a noticeable increase in the proportion of students who appropriately respond to items on nutrition-related clinical practices. However, limitations in cohort sizes and response rates prevent further statistical analysis or interpretation of this data. At the conclusion of nutrition education teaching in the first clinical year, students provide written feedback on the delivery and content of the workshops as well as suggestions for future improvements. Students frequently report that the workshops are comprehensive, appropriately interactive, and useful for informing future practice. Suggestions for improvements typically relate to providing more teaching time to cover additional nutritional topics, a common challenge reported within other medical schools.8,28,29 As a result, the course delivery has been appropriately modulated to allow students sufficient time to experience allocated activities. We identified three key opportunities for improvement to the medical nutrition education initiative at the University of Cambridge, School of Clinical Medicine. Firstly, we believe that the evaluation of students’ nutrition competence could be enhanced in the first clinical year. Given the challenges involved in obtaining completed responses to the evaluation questionnaire, strategies to ensure that all students complete the questionnaire before and 1 month after the nutrition education sessions are recommended. These strategies may include incentives for completion of the survey or promoting the survey as a mandatory nongraded piece of assessment. In addition, the existing ten-item questionnaire was based on a previously developed tool42 which informed the questionnaire used in the early work of NNEdPro.22 Since this time, other tools such as the Nutrition in Patient Care Survey and Nutrition in Medical Education Survey have been developed43 and provide a more comprehensive investigation of students’ changes in nutrition knowledge, attitudes, and practices.7,43–45 It is also important to comprehensively evaluate knowledge, attitudes, and practices as inadequacies in these areas are known to adversely impact on doctors’ ability and willingness to perform nutrition counseling.46–48 Therefore, we recommended that the questionnaire is reviewed to provide an objective, in-depth investigation of students’ changes in confidence and skills. Secondly, we believe the NERG could include nutrition in written and practice-based clinical exams to drive student learning and provide additional information on students’ nutrition-related competence.26 While the nutrition content is currently not assessed, preliminary discussions have occurred to incorporate nutrition into the written and practical examinations for students in their first clinical year. Incorporation of nutrition into assessments raises the profile of nutrition and reinforces the importance of nutrition in patient care to both students and academics.39 In addition, we suggest it provides a means to measure relevant indicators of nutrition-related clinical effectiveness such as nutrition knowledge, malnutrition identification, along with referral to dietitians and other health professionals. Finally, we suggest that the current curriculum be mapped against the national recommendations of the Academy Nutrition Group of the Academy of the Medical Royal Colleges.27 Mapping the current curriculum to these recommendations will identify components of the recommended curriculum already covered and those that require inclusion after future curricula reviews. Further alignment of the current medical nutrition education with these recommendations is likely to result in comprehensive coverage of relevant nutritional areas. In this paper, we have provided an overview of the progress of medical nutrition education at the University of Cambridge, School of Clinical Medicine. A vertical, spiral medical nutrition education initiative occurs during the clinically focused years of the undergraduate and graduate medical degree. We identified three factors that have contributed to the success of the initiative, which are the leadership and advocacy skills of the nutrition academic team, the variety of teaching modes, and the multidisciplinary approach to teaching and practice. We outlined opportunities for continuing improvement to the medical nutrition education initiative including review of evaluation tools, inclusion of nutrition in assessment items, and further alignment of the current curricula with the recommended curriculum for medical nutrition education in the UK. The authors wish to acknowledge Dr Jeremy Woodward, Dr Adrian Park, Dr Lisa Sharkey, Serena Skeret, Carla Pearson, Mary-T Casserly, Jayshree Ramsurun, Mike van der Es, Dr Joan Gandy, Tim Eden, Jean Redmond, and Mary Ghasemi. Dr S Ray is supported primarily by the UK Medical Research Council. The teaching overseen by the NERG is funded through the University of Cambridge Public Health teaching strand. World Health Organization. Diet, Nutrition and the Prevention of Chronic Diseases. Geneva: World Health Organization; 2003. Available from: http://whqlibdoc.who.int/trs/who_trs_916.pdf. Accessed December 1, 2013. Townsend P, Davison N, Whitehead M, editors. Inequalities in Health: The Black Report; The Health Divide. London: Penguin Books; 1992. HealthyPeople 2020 [homepage on the Internet]. Washington, DC: United States Department of Health and Human Services. Available from: http://www.healthypeople.gov/2020/default.aspx. December 1, 2013. Royal College of Physicians of London. Nutrition and Patients: A Doctor’s Responsibility. London: Royal College of Physicians of London; 2002. General Medical Council. Tomorrow’s Doctors; Outcomes and Standards for Undergraduate Medical Education. London: General Medical Council: 2009. Available from: http://www.gmc-uk.org/TomorrowsDoctors_2009.pdf_39260971.pdf. Accessed December 1, 2013. Leslie FC, Thomas S. Competent to care. Are all doctors competent in nutrition? Proc Nutr Soc. 2009;68(3):296–299. Vetter ML, Herring SJ, Sood M, Shah NR, Kalet AL. What do resident physicians know about nutrition? An evaluation of attitudes, self-perceived proficiency and knowledge. J Am Coll Nutr. 2008;27(2):287–298. Adams KM, Kohlmeier M, Powell M, Zeisel SH. Nutrition in medicine: nutrition education for medical students and residents. Nutr Clin Pract. 2010;25(5):471–480. Kolasa KM. Developments and challenges in family practice nutrition education for residents and practicing physicians: an overview of the North American experience. Eur J Clin Nutr. 1999; 53(Suppl 2):S89–S96. Cimino JA. Why can’t we educate doctors to practice preventive medicine? Prev Med. 1996;25(1):63–65. Haenel H. Nutrition in Medical Education. Report of the British Nutrition Foundation’s Task Force on Clinical Nutrition. Herausgegeben von J. Gray. 35 Seiten, 3 Anlagen. The British Nutrition Foundation, London 1983. Preis:1,95 £. Nahrung. 1985;29:458. National Research Council. Nutrition Education in US. Medical Schools. Washington, DC: The National Academies Press; 1985. Council of Europe Alliance. 10 Key Characteristics for Good Nutritional Care. London, 2006. Available from: http://www.thenacc.co.uk/assets/downloads/139/10%20key%20Characteritstics%20of%20Good%20Nutritional%20Care%20poster.pdf. Accessed April 7, 2014. 101st US Congress. National Nutrition Monitoring and Related Research Act of 1990. Public law 101-445. Washington, DC: US Congress; 1990. Available from: http://www.gpo.gov/fdsys/pkg/STATUTE-104/pdf/STATUTE-104-Pg1034.pdf. Accessed December 1, 2013. Walker WA. Innovative teaching strategies for training physicians in clinical nutrition: an overview. J Nutr. 2003;133(2):541S–543S. Heimburger DC. Physician-nutrition-specialist track: if we build it, will they come? Intersociety Professional Nutrition Education Consortium. Am J Clin Nutr. 2000;71(5):1048–1053. Krebs NF, Primak LE. Comprehensive integration of nutrition into medical training. Am J Clin Nutr. 2006;83(4):945S–950S. Taren DL, Thomson CA, Koff NA, et al. Effect of an integrated nutrition curriculum on medical education, student clinical performance, and student perception of medical-nutrition training. Am J Clin Nutr. 2001;73(6):1107–1112. Underbakke G, McBride PE, Spencer E. Web-based resources for medical nutrition education. Am J Clin Nutr. 2006;83(4):951S–955S. Hark L, Morrison G, editors. Medical Nutrition and Disease: A Case-Based Approach, 3rd ed. Malden, MA: Blackwell Publishing; 2003. Need for Nutrition Education Programme. Five year update: the need for nutrition education programme. Perspect Public Health. 2013;133(2):78. Ray S, Udumyan R, Rajput-Ray M, et al. 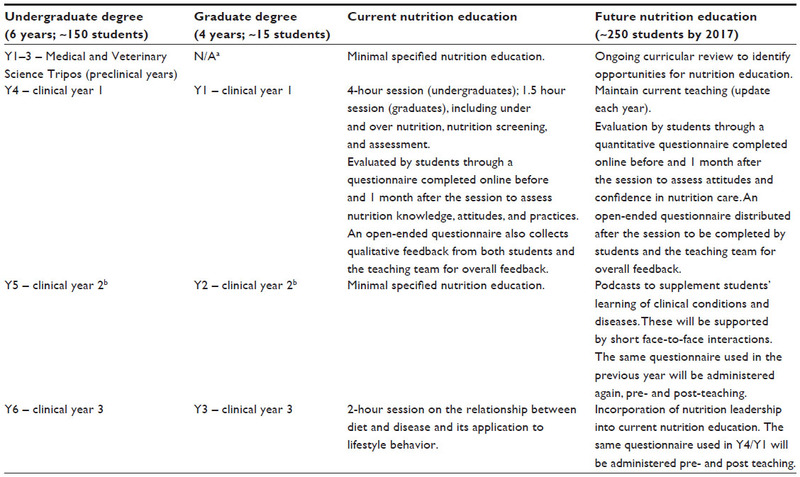 Evaluation of a novel nutrition education intervention for medical students from across England. BMJ Open. 2012;2:e000417. Ray S, Laur C, Rajput-Ray M, Gandy J, Schofield S. Planning Nutrition Education Interventions for the Medical Workforce: ‘Nutrition Education Workshop for Tayside Doctors’ (NEWTayDoc) A pilot project to inform development of the Need for Nutrition Education Programme (NNEdPro). Scotland: MedEdWorld; 2012. Available from: http://www.nnedpro.org.uk/wordpress/wp-content/uploads/2013/08/PlanningNutritionEducationInterventions.pdf. Accessed December 1, 2013. University of Cambridge. School of Clinical Medicine [homepage on the Internet]. Cambridge: University of Cambridge. Available from: http://www.medschl.cam.ac.uk. Accessed December 1, 2013. Bringing physician nutrition specialists into the mainstream: rationale for the Intersociety Professional Nutrition Education Consortium. Am J Clin Nutr. 1998;68(4):894–898. Kushner R, Van Horn L, Rock C, et al. Nutrition education in medical schools: a time of opportunity. Am J Clin Nutr. Epub 2014 March 19. Academy of Medical Royal Colleges. UK Undergraduate Curriculum in Nutrition. London: ICGN Undergraduate Nutrition Education Implementation Group 2013. Available from: http://www.aomrc.org.uk/intercollegiate-group-on-nutrition/curricula.html. Accessed April 7, 2014. Lindell KC, Adams KM, Kohlmeier M, Zeisel SH. The evolution of Nutrition in Medicine, a computer-assisted nutrition curriculum. Am J Clin Nutr. 2006;83(4):956S–962S. Adams KM, Lindell KC, Kohlmeier M, Zeisel SH. Status of nutrition education in medical schools. Am J Clin Nutr. 2006;83(4):941S–944S. Martin GA, Double JM. Developing higher education teaching skills through peer observation and collaborative reflection. Innov Educ Train Int. 1998;35(2):161–170. Le Gardeur BY, Lopez-SA. Nutrition and cancer: a curriculum and short student research experiences. J Cancer Educ. 2000;15(3):137–139. Heimburger DC, Stallings VA, Routzahn L. Survey of clinical nutrition training programs for physicians. Am J Clin Nutr. 1998;68(6):1174–1179. Weinsier RL, Boker JR, Brooks CM, et al. Nutrition training in graduate medical (residency) education: a survey of selected training programs. Am J Clin Nutr. 1991;54(6):957–962. Jackson AA. Human nutrition in medical practice: the training of doctors. Proc Nutr Soc. 2001;60:257–263. Creating an Interprofessional Workforce. Creating an Interprofessional Workforce: An Education and Training Framework for Health and Social Care in England. London: Creating an Interprofessional Workforce; 2007. Available from: http://caipe.org.uk/silo/files/cipw-fw-doc.pdf. Accessed December 1, 2013. Barr H. Undergraduate Interprofessional Education. London: Centre for the Advancement of Interprofessional Education; 2003. Available from: http://www.gmc-uk.org/Undergraduate_interprofessional_education.pdf_25397207.pdf. Accessed December 1, 2013. Friedman G, Kushner R, Alger-Mayer S, Bistrian B, Gramlich L, Marik PE. Proposal for medical school nutrition education: topics and recommendations. JPEN J Parenter Enteral Nutr. 2010; 34(Suppl 6):40S–46S. Pearson TA, Stone EJ, Grundy SM, McBride PE, Van Horn L, Tobin BW; NAA Collaborative Group. Translation of nutritional sciences into medical education: the Nutrition Academic Award Program. Am J Clin Nutr. 2001;74(2):164–170. Hark LA. Lessons learned from nutrition curricular enhancements. Am J Clin Nutr. 2006;83(4):968S–970S. National Heart Lung and Blood Institute and Division of Cardiovascular Sciences. Working Group on Future Directions for Implementing Nutrition Across the Continuum of Medical and Health Professions Education and Training, and Research [webpage on the Internet]. September 10–11, 2012; Bethesda, MD. Executive summary. Available from: http://www.nhlbi.nih.gov/meetings/workshops/nutrition.htm. Accessed December 1, 2013. Bipartisan Policy Center. Lots to Lose: How America’s Health and Obesity Crisis Threatens our Economic Future. Washington, DC: Health Program, Nutrition and Physical Activity Initiative; 2012. Available from: http://bipartisanpolicy.org/sites/default/files/5023_BPC_NutritionReport_FNL_Web_0.pdf. December 1, 2013. Nightingale JM, Reeves J. Knowledge about the assessment and management of undernutrition: a pilot questionnaire in a UK teaching hospital. Clin Nutr. 1999;18(1):23–27. Walsh CO, Ziniel SI, Delichatsios HK, Ludwig DS. Nutrition attitudes and knowledge in medical students after completion of an integrated nutrition curriculum compared to a dedicated nutrition curriculum: a quasi-experimental study. BMC Med Educ. 2011;11:58. McGaghie WC, Van Horn L, Fitzgibbon M, et al. Development of a measure of attitude toward nutrition in patient care. Am J Prev Med. 2001;20(1):15–20. Mihalynuk TV, Scott CS, Coombs JB. Self-reported nutrition proficiency is positively correlated with the perceived quality of nutrition training of family physicians in Washington State. Am J Clin Nutr. 2003;77(5):1330–1336. Huang J, Yu H, Marin E, Brock S, Carden D, Davis T. Physicians’ weight loss counseling in two public hospital primary care clinics. Acad Med. 2004;79(2):156–161. Hiddink GJ, Hautvast JG, van Woerkum C, Fieren C, van’t Hof M. Driving forces for and barriers to nutrition guidance practices of dutch primary care physicians. J Nutr Educ. 1997;29(1):36–41. Kushner RF. Barriers to providing nutrition counseling by physicians: a survey of primary care practitioners. Prev Med. 1995;24(6):546–552.